I first mentioned Josie Wheeler in August 2013’s “Misc. Mortuary Mysteries.” Much of Josie’s biography remains shrouded in secrecy but in the months since originally conjuring Josie’s name from obscurity I’ve uncovered new information that sheds more light on her life and her tragic final hours on this mortal coil. Sadly I don’t have a tombstone or grave location and based on new evidence I’m not even certain that she’s buried in Danville anymore. According to Green Hill Cemetery’s Mortuary Records Josie (age 18) died as the result of opium poisoning and was buried in an undisclosed location on the grounds in November 1891. That entry was dated the 11th, which is most likely the date she was interred. Virginia’s Deaths and Burials Index also has the 11th listed as the date she died. That was a very quick burial, raising a flag as to whether or not she had family in the city to mourn her or if the city interred her in a potter’s or pauper’s area. 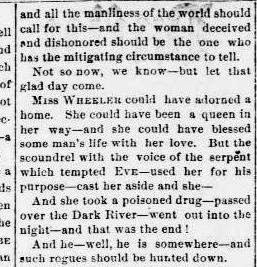 An article in a Richmond newspaper reported that Josie’s death was a suicide and that she’d been shipped back to Winston-Salem, North Carolina for burial on the 12th. A reinterment is likely because her family lived in Winston and at the time she died they were possibly estranged. With the knowledge that she had lived in North Carolina I searched for anything about Josie’s childhood. The only record was an 1880 census, which listed her parents as George W. Wheeler (a “U.S. Officer”) and Sallie Saunders Wheeler. Josie, her parents and siblings George Jr. (b. abt. 1877) and Bettie (b. 1879) lived in Asheboro, North Carolina. Also in the household was a servant, Louisa Frank, and her infant son John. 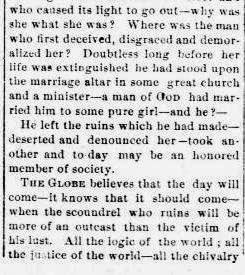 This editorial-styled article ran in the November 13, 1891 edition of The Durham Daily Globe. It’s based around Josie’s suicide but it reads more like a sermon or condemnation of a lifestyle rather than fact-sharing. This brings us back to the question of where Josie’s body rests today. Her brother George died in 1914 of Pellagra/Pellagra Insanity and was buried in Winston-Salem’s Woodland Cemetery according to his death certificate. A Bettie Wheeler (who was perhaps Josie’s sister) died in 1899 and was interred in the same city at the Salem Moravian Graveyard. I hoped that searching those cemeteries would lead to the graves of other family members, but couldn’t locate the graves of Josie or her parents. We don’t know the circumstances that drove Josie to the sporting house or to take her own life. There could have been chemical or environmental factors at play, such as mental illness or family issues. It’s not the job of the media or the community to judge Josie or anyone else for working in that field. While previous suicidal ideations suggest that she wasn’t happy at the brothel, other women employed in the industry might have found it to provide a profitable and comfortable living. Just look at Agnes and Lizzie Langley, who were among Lynchburg’s wealthiest citizens.